If you’re an avid follower of autoX, you must know that every year we head to the Buddh International Circuit for our annual track test. What we basically do there – in the name of work, that is – is thrash all the latest machines from the year to our heart’s content. This includes everything – from commuter motorcycles and family hatchbacks to high-end superbikes and supercars. Note: For our annual track test, we used the highly technical back-section (north loop) of the BIC. The total circuit length, as a result, was reduced from 5.1km to 2km. The lap times were set by ace motorcycle racer, Sarath Kumar. Ducati brought the updated Monster 821 in the country earlier in 2018. Now it may not be the fastest or most powerful bike in its segment, but the Monster 821 set the fastest lap time during our annual track day, claiming the Performance Bike of the Year award. The reason is plain and simple – it’s mighty powerful, supremely agile and its L-Twin motor offers oodles of torque throughout the rev range. Sure, it’s not superbike sharp, but then it isn’t a lazy handler either. And the best part is that it feels lightning fast on the streets and the performance is easily accessible. More importantly, it’s not a back-breaker like other naked/sports bikes. What’s more, it looks mean and devilish, living true to its Monster moniker. This BMW Motorrad duo was quite literally the surprise of the year for us. You look at these two and think they are tall adventure tourers, which are only suited for off-roading and highway cruising, and they aren't something to set lap times on a racetrack. Wrong! You see, while these two do everything that an ADV is supposed to do, they are phenomenal even when you are corner carving. The handling, braking and the overall balance of these two middleweight Beemers are sublime. So much so that they turned out to be much quicker than expected. Both these motorcycles share the same underpinnings, but, of course, the F 850 GS has more power and comes with higher grade cycle parts (upside down forks, spoke wheels,etc.) as compared to the F 750 GS. But, at the end of the day, both are equally exciting – on the road, off it and around a racetrack. The Monster 821 may have been the quickest bike in terms of setting a lap time, but the Multistrada 1260 Pikes Peak is what we think is Ducati’s actual ‘monster’. On paper, it may appear to be another very powerful ADV. But from what we can tell – after riding it – is that it’s an absolute hoot. It looks big and intimidating, but it goes like a scalded cat. It’s as if it suffers from a split personality disorder – one moment, it feels like a relaxed cruiser, and then within a blink of an eye it turns into a lethal weapon, sniffing long straights and cutting apexes with sports bike-like urgency. Plus, it looks like a million dollars. All told, the whole experience of riding this machine is just so overwhelming that you can’t help but fall head over heels in love with this motorcycle. The Suzuki GSX-S750 was part of our annual track test, but it couldn’t set a lap time with Sarath on-board, owing to some issues. However, while he couldn’t get his hands on the Suzuki, we actually did spend a lot of time with this naked middleweight. And, we reckoned, it could have lapped the circuit faster than the Monster 821. Now, you may say that it’s heavier than the Ducati, but then don’t forget that it produces more power, and it’s also the better handler of the two. And that in-line four motor of the GSX-S750 is a gem – the way it revs and delivers power is intoxicating. The speed build up from behind the bars is scintillating, to say the least. In fact, it’s not just the go – the way it sheds speed is also quite impressive. Out in the real world, it feels equally good, too. And the best part about the GSX-S750 is that all of this is offered at a very reasonable price. Let’s be clear here. We didn’t have the Ducati Panigale V4 for our track test, and nor did we set this lap time that you see here. Instead, this phenomenal lap was set by Ducati’s test-rider Alessandro Valia, while he was in India for the Ducati DRE Track Days. And, since we are on the topic, let me tell you that this is the fastest that a production motorcycle has gone around the Buddh International Circuit! So why do we have the Panigale V4 on this list? Well, simply because it’s undoubtedly the fastest motorcycle that we’ve tested in 2018. 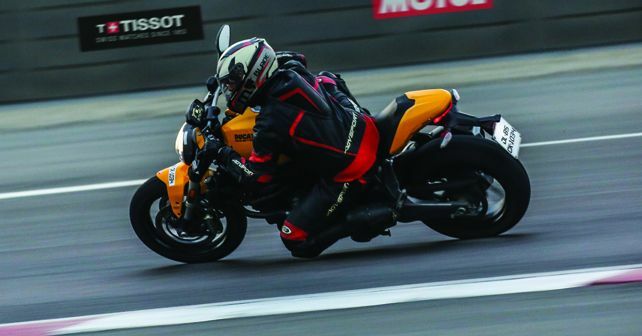 We first got to taste its madness at the Sepang International Circuit, where we rode the Panigale V4 S, and then more recently we also got to hop on the ‘standard’ V4 at the Buddh International Circuit. If we were to sum up the whole experience in a word, we’d say the Panigale V4 is relentless. It’s an outright speed machine and nothing else on this list compares to the way this thing picks up the pace. The performance, handling, electronics and looks – everything about the Panigale V4 is next level. It’s hands down the most thrilling motorcycle that we rode in 2018.